Hey everybody! 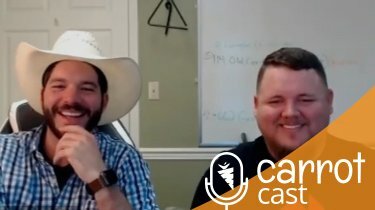 I’ve got a special guest with me today on this episode of the CarrotCast. I’ve known Joe McCall for years. Funny thing is, I didn’t even realize it until after we recorded this, I’m going to see him four times in person in the next about 60 days at four different Masterminds. Kind of cool, and we have a chance to talk about a lot of cool stuff on here. So the main things that you’re going to be grabbing away from this Podcast. There are some really cool things we didn’t even intend on diving into on the impact of Masterminds and what we’ve done with them and how you can even start your own the way that we have. We dive into that, we dive into wholesaling lease options. Why in this market environment, you need to be doing creative real estate because if you’re not doing creative real estate in this market environment where we’re at or near the top of the market, you can’t keep on doing things the way you’ve been doing it the last one or two or three years. 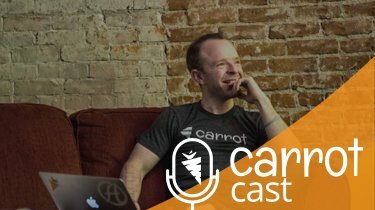 We’ve seen Carrot customers go out of business, because they haven’t shifted it off of their strategy. So are you molding your business around your solution and not changing your solution? Are you molding your business around solving the problem your clients find? One of the ways that you can do that is with wholesaling and lease options and we dive into that in pretty good detail. 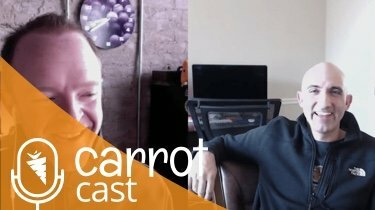 1:35 – Joe’s LOVE for Carrot and why he can’t understand when people think they can do it on their own. 6:00 – How Joe started his own mastermind to help others grow their real estate investing business. 10:55 – The fruit of your labors pay off. Joe shares his thoughts about giving more than you expect to get back. 14:10 – Falling from the corporate ladder. Joes path into real estate investing. 20:50 – Be aware of what is going on around you. How to ride the market upswings and downswings wave. 24:00 – Why you need to educate yourself on creative real estate strategy. 25:50 – Knowing what the “Smart Money” is doing next. Setting yourself up for the next real estate phase. 29:30 – GOLD TIPS: How to use a list source. 34:05 – Joe’s phone system method. 36:50 – Standing out from your competition. On and Offline strategies. 43:25 – How online marketing impacts your offline marketing. Also, how one Carrot member could making hundreds of thousands more just from making the switch to Carrot. 45:45 – Where wholesaling lease options can play into your real estate strategy. 51:20 – The wholesaling lease options avatar. 54:50 – What is mechanically different within the types of offers Joe makes for wholesaling lease options.